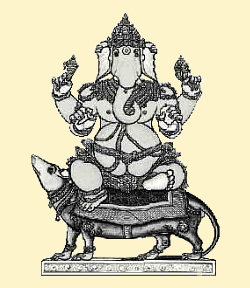 Riding on His docile and friendly mouse, Srishti Ganapati is the lord of happy "Manifestation." 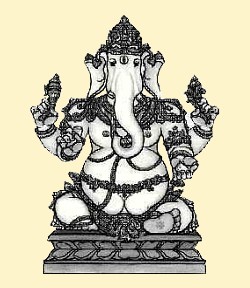 This active God, of red complexion, holds His noose a goad, a perfect mango, and His tusk, representing selfless sacrifice. Ekadanta of "Single Tusk" is distinguished by His blue color and sizable belly. The attributes of this murti are an axe for cutting the bonds of ignorance, prayer beads for japa, a laddu sweet and the broken right tusk. 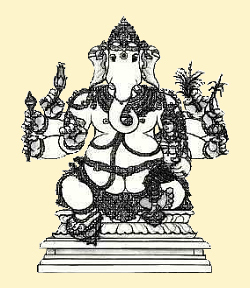 Haridra Ganapati, the golden one dressed in bright yellow vestments, sits calmly on a posh, regal throne. Along with His tusk and a modaka, He wields a noose to hold devotees close and a sharp goad to spur them onward. 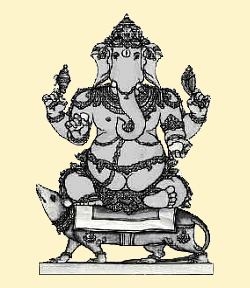 Kshipra Prasada Ganapati, "the Quick Rewarder," presides from a kushagrass throne. His big belly symbolizes the manifest universe. 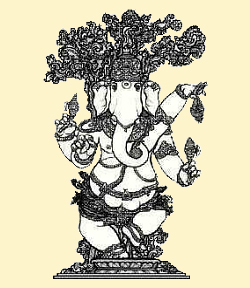 He holds a noose, goad, tusk, lotus, pomegranate and a twig of the wish-fulfilling tree. 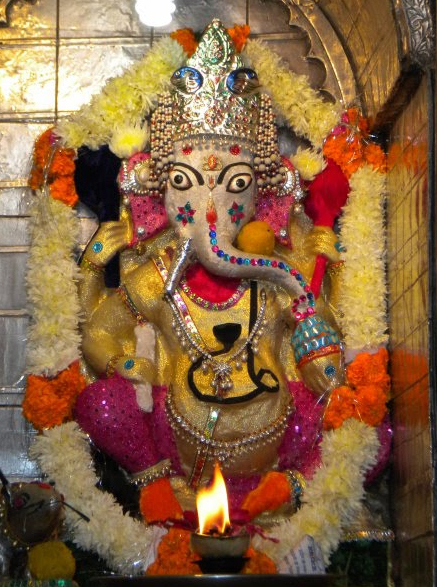 Tryakshara Ganapati, "the Lord of Three Letters" (A-U-M), is gold in color and has fly whisks in His big floppy ears. He carries the broken tusk, goad, noose and mango and is often seen grasping a sweet modaka in His trunk. 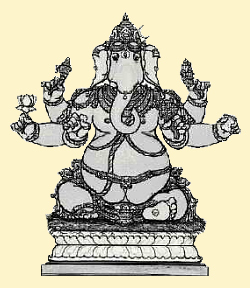 Varada Ganapati, "the Boon-Giver" with prominent third eye of wisdom, holds a dish of honey, the noose and goad and encloses a pot of jewels in His trunk. His Shakti is at His side, and the crescent moon adorns His crown. 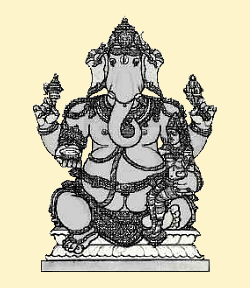 Ekakshara ("Single-Syllable" of 'gam') Ganapati is three-eyed, has red complexion and attire. Crescent moon on His crown, He sits in lotus pose upon Mushika, offers the boon-giving gesture and holds a pomegranate, noose and goad. This Ganesa is in the Junagarh Fort, Bikaner, Rajasthan. 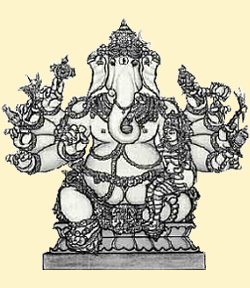 Ganesh idol is carved out of Murju stone and is in seating attitude. More importantly this Ganesh idol is two handed as against four in usual. Devotees feel blessed to see this 6 feet tall and four and half feet wide, beautiful, godly idol of Lord Ganesh. The box was muddy as it was buried and looked ancient. It had some words written from the 10 century in Sanskrit. This incident attracted all the mob from the Diveagar village. It was to everyone's astonishment as what could be in the box? There was a sculpture of Lord Ganesh made out of pure gold. Also the box contained ornaments belonging to Lord Ganesha. It was then that the god was named "Suvarnaganesh". 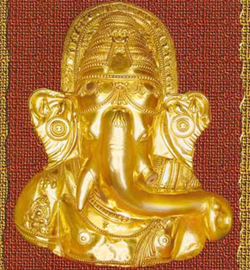 Suvarnaganesh is a complete idol of Lord Ganesha, but a sculpture of pure 24 caret gold. Its weighted 1 kilo and 300grams ,with height of 60cm(24 inches). The sculpture made is 300 to 400 years ancient. It is said that this sculpture was created to mask some Lord Ganesh stone idol, which was earlier in the temple. However its still a puzzle as to who has buried it and for what reason. But people of Diveagar have tremendous faith in Suvarnagensh and that the god is blessing the place with prosperity. 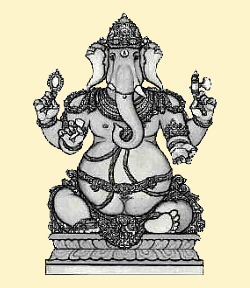 Seated with one of His shaktis on His left knee, Urdhva Ganapati is "the Elevated" Lord of golden hue. In His six hands He holds a sprig of paddy, a lotus, the sugar cane bow, an arrow, His ivory tusk and a blue water lily. May the tusked one guide us on the right path. The happy "Dancer", Nritya Ganapati, is four-armed and golden, with rings on His fingers, holding a tusk, goad, noose and modaka sweet. He prances under the kalpavriksha tree, epitomizing exuberant activity and joy. 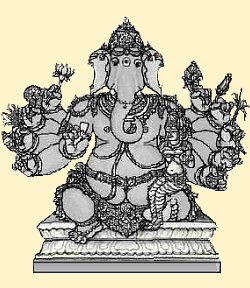 Four-armed, of red hue and riding His resourceful mushika, Vijaya Ganapati is "the Victorious" bestower of success. His insignia are the broken tusk, elephant goad, a noose and a lucious golden mango, His favorite fruit. 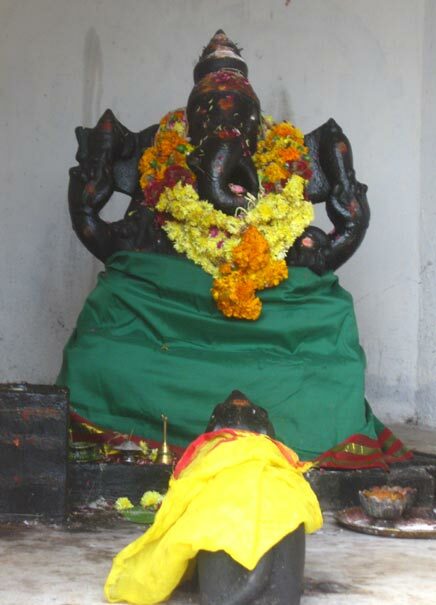 Accompanied by one of His shaktis, the Great "Maha Ganapati" is red complexioned and three-eyed. 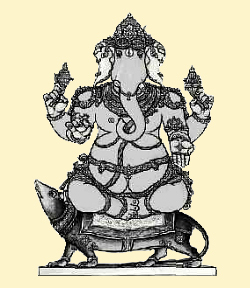 He holds His tusk, a pomegranate, blue lily, sugarcane bow, discus, noose, lotus, paddy sprig, mace and a pot of gems. 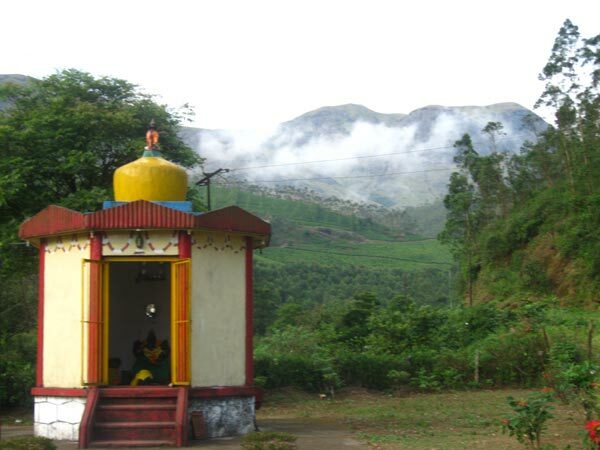 This Ganesh temple is on the road to the Rajamala Hills, Munnar, Kerala.